The following is an uncut version of an article I wrote the Press & Sun-Bulletin. The newspaper version, which ran on Dec. 21, 2014, was cut due to space constraints The full version is reprinted here with permisson of the paper. In certain places in New York, Wednesday’s news of the state’s ban on fracking inspired public celebration. When a manager at GreenStar Natural Foods Market in Ithaca announced the news over a loud speaker, people in the store began applauding, cheering, shouting and hugging. “People had worked for this for so long,” said Dawn Lodor, an assistant manager at the store, which helped organize opposition to shale gas development. It was no surprise that the news was emotionally charged. But, for people on both sides of the issue, it was an abrupt endpoint of an epic policy fight that began nearly seven years ago. New York’s shale gas story will be cast in history as one of false starts, near misses, empty promises, and a grass roots movement of the ages. From the beginning, some harbored great expectations for a shale gas boom in the Southern Tier. In the end it was a bust that never got off the ground. I began learning the full implications of the shale gas story one day in early May, 2008, when several visitors came to the Binghamton Press & Sun-Bulletin newsroom. These sources included Fitzsimmons, long before he was president of the Joint Landowners Coalition of New York, and Tim Whitesell, Town of Binghamton Supervisor. 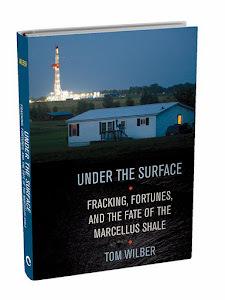 At the time, few people knew what fracking was, and most associated “Marcellus” with a small town in Upstate New York. Sitting with a group of editors in “the pit” a wall-less space in the corner of the news room with a sunken floor and a white board where editors jotted story ideas, our sources informed us that agents representing gas exploration companies – “landmen” – were seeking mineral rights to the land in the towns of Conklin and Binghamton. The landmen tended to approach people with the largest tracts first. These were often farmers or descendents of farmers, and many of them were duly skeptical, but excited. What was not to like about the notion of abundant energy that could be safely extracted from beneath the land with deals that could make people rich? That was what the landowners were told, at least, and that’s what they hoped for. Southern Tier residents were learning that the first successful wells in the Marcellus –featuring a combination of new techniques -- had spurned a burgeoning gas rush just across the border in Susquehanna County, Pennsylvania. Unlike the type of conventional drilling western New Yorkers were familiar with – clusters of vertical wells generally contained in a geographically limited area – this shale gas development involved drilling into rock that extended under entire states. Operations would encompass vast regions. It required unconventional technology. Well bores would be oriented horizontally along the vast mantel of Marcellus rock, and then the bores would be injected with pressurized solutions of unknown but effective chemicals to break the rock and free the gas. The scope, scale, and sums of money were seemingly unprecedented. For the next six-plus years, the story would be told through several hundred articles in Gannett’s Upstate New York newspapers. It would play out one way in New York, and another way in Pennsylvania, with outcomes that reflect each state’s political attitudes and comfort levels with mineral extraction. As the price of natural gas approached record highs in early 2008, the fervor over gas development spurred ever more aggressive efforts of landmen charged with securing acreage for drilling. They also fostered growing expectations among landowners seeking a deal of a lifetime. The bidding rose from hundreds of dollars per acre to thousands of dollars per acre, and in the newsroom, we heard complaints from landowners who had signed away their land rights without understanding the value of the mineral resources. With this concern, early stories seized on the efforts of Chris Denton, an Elmira attorney, and members of the New York Farm Bureau, who became important advocates for landowners. They gave presentations to audiences packing school auditoriums and town halls in places where landmen were sent to secure acreage, which at the height of the leasing frenzy in 2008 included a large part of upstate New York. Many Southern Tier owners saw the approach of the landmen as a Beverly-Hillbillies–moment. But at his presentations, Denton gave a sobering message: Beware of the industry lease. It’s “a complex-business transaction masquerading as a lottery ticket.” A standard lease was worded in a way that gave operators rights to minerals under their land, of course, but it also gave them rights to do whatever they needed above land to get at riches below. The state’s permitting guidelines –designed for conventional drilling -- were outdated and insufficient to handle shale gas development. This made matters worse. Landowners had to take matters into their own hands by crafting land-use agreements to ensure environmental safeguards. Denton was the first of several attorneys who would begin advising landowners groups on leasing strategies. The story went from big to bigger on May 11, 2008 with news from Sanford, a town of 2,400 people on the eastern edge of Broome County. Dewey Decker, town Supervisor, headed a group of 300 farmers – controlling some 50,000 acres – who banded together to leverage bargaining power against companies. None of the landowners would sign a lease without a deal that was acceptable to all. With this technique, the Deposit group landed a deal with XTO Energy for $90 million. That figure would soon grow to $110 million with subsequent sign-ons. The terms included $2,411 per acre for leasing rights for five years and the same amount for the three-year extension. In addition, if prospectors hit gas, the landowners would get 15 percent of the royalties. Without a single well drilled, many of the farmers, including Decker, made more in a single day than they would their entire lives. Mega deals were also being signed in Pennsylvania, and the media coined a new word for farmers like Decker: Shallionaires. News of the XTO deal fueled a gold rush mentality in the Southern Tier. People began reasoning that, if XTO found resources under the land in the Town of Sanford with that kind of value, then other gas companies prospecting in nearby towns along the Pennsylvania Boarder also harbored riches. Lease offers reported in Broome County towns bordering Pennsylvania soared. In some areas along the Millennium Pipeline, where the market produced a premium for ready access to infrastructure, offers rose to $5,000 an acre or more. XTO was a $13 billion company that would later be bought out by Exxon Mobil, and a far cry from the smaller independent operators that had done business in New York. People were rightly filled with a sense that they were heading into unfamiliar territory with the Marcellus prospects, and they began crowding town halls and school auditoriums in their quest for information. Many of the meetings were sponsored by town officials seeking answers from officials from the state Department of Environmental Conservation about how the impacts from shale gas development would be managed in New York. One such meeting, on July 16, 2008 in the municipal building of the town of Chenango, was crowded with farmers, suburbanites and officials from town, county and state governments. They were not necessarily against fracking, but they had plenty of questions. What about public safety concerns, roads, and waste disposal? Linda Collart, regional supervisor with the Division of Mineral Resources, assured the crowd that there would be little or no impact; the agency had been managing gas development for generations. In her power point presentation, she showed a picture of what shale gas development would look like: A small valve poking from the ground with a lush meadow of wildflowers and grasses in the foreground an a bank of trees in the background. This was a reclaimed natural gas site, she said, and an example of the expected long-term impact from Marcellus development. In what would become a defining moment in the local history of the shale play, a person from the back of the room stood up and asked her how local emergency responders could prepare for a spill, fire, or explosion when the industry did not fully disclose the complete chemical content and concentrations of fracking fluids. Another person stood up and asked how regulators were preparing for an influx of drilling that would exceed any historical comparison. Collart stood by that line at several meetings, and the more she gave it, the more agitated and skeptical towns folks became. A meeting in Greene was scheduled the day after I reported Collart’s responses at the Town of Chenango meeting. For this, Governor David Paterson’s office, responding to growing skepticism about the DEC’s ability to manage shale gas, sent Judith Enck, the governor’s top environmental advisor and Stuart Gruskin, executive deputy DEC commissioner. As with earlier meetings, the questions reflected frustration from the crowd of more than 500 people who felt they were not getting straight answers, but Enck’s response was different than Collart’s. Within days of the Greene meeting, the state legislature approved a bill, pushed by gas companies and submitted by the DEC, that would make spacing units for the large Marcellus gas wells more uniform – a move that would effectively streamline the permitting process. Without it, shale gas development would get hung-up on an administrative process designed for the much smaller conventional wells. Paterson signed the industry-supported bill. But, with input from Enck and Gruskin, he also declared that permitting could not begin until the agency under took a comprehensive review of its impacts. The document, know as the Supplemental Generic Environmental Impact Statement (or SGEIS) was born. At the time, even gas supporters didn’t seem to mind the time out, which they saw as a necessary step to make things move smoothly. “It’s a process in which we will be learning as we move forward,” said state Senator Tom Libous, sponsor of the spacing bill. “We have to make sure the environment is protected. I am pleased so far.” At the time, people expected the review to take a year or less, and shale gas would begin soon in New York. Before the SGEIS could be finalized, it had to go through a public review process. This standard procedure for public policy would make the document a critical instrument for the anti-fracking movement to delay shale gas until people finally got the answers to the questions raised at public meetings. The more they found out, the more questions they had. The second turning point of the story came with a bang, literally, on New Years Day, 2009 in Dimock, Pennsylvana. An explosion rocked the frozen ground in Norma Fiorentino’s front yard and concrete dust billowed over a gaping hole where her water well was housed. The blast destroyed the well that supplied her trailer on her 7-acre homestead. Though there were no casualties, the incident raised many questions and, eventually, led to state and federal investigations about the safety and viability of shale gas development in Susquehanna County. In months and years that followed, the Pennsylvania state Department of Environmental Protection found that methane was seeping from nearby gas wells drilled by Cabot Oil and Gas into water wells in the area where Norma lived. Cabot responded that methane comes from the ground and factors other than drilling can bring it into contact with water supplies. Cabot denied that its operations caused the problem, and at one point accused the DEP of fabricating the story. The events in Dimock highlighted a battle over whether fracking was a good thing or a bad thing. At the heart of it was the issue of trust, and who could be believed – industry, government, or neither. The industry, at the time, was standing by a claim that fracking had not contaminated a single water well throughout its history. This motivated journalists, critics, and activists who sensed a bending of the facts and possibly a cover up. After Norma’s well exploded, Walter Hang, head of an environmental research firm in Ithaca, began searching data bases from the DEC to see if he could find records ot similar incidents in New York State. He uncovered 270 files documenting wastewater spills, well contamination, explosions, methane migration and ecological damage related to gas production in the state since 1979. Those findings were the subject of an article in this paper on Nov. 8, 2009. Continuing his research in 2010, Hang uncovered documents that showed William T. Boria, a water resources specialist at the Chautauqua County Health Department, reported his agency had received more than 140 complaints related to water pollution or gas migration associated with nearby drilling operations. In a 2004 memo summarizing the issue, Boria stated: "Those complaints that were recorded are probably just a fraction of the actual problems that occurred." County health officials tabulated information on 53 of the cases from 1983 to 2008 on a spreadsheet, including one where a home was evacuated after the water well exploded. The first draft of the SGEIS had been released on September 30, 2009, and by then the anti-fracking movement was becoming a powerful grass-roots phenomenon. The first public hearing on the state’s policy proposal to permit shale gas was held six weeks later at the Chenango Valley High School. It had more the feel of a pep rally than a public hearing. Environmental conservation officers wearing ranger’s hats and bearing sidearms stood attentively at various entrances and milled about the lobby as more than 1,000 people filled the auditorium to capacity. For the next three hours, speakers lined up for a turn at the microphone, where they offered impassioned praise or criticism of the drilling industry and its plans to set up shop in Broome County. The meeting in Broome County was one of four throughout the state, and each drew a large and impassioned response. could become final. The anti-fracking movement won its first and major victory in stalling a decision on shale gas. In the years that followed, those who favored shale gas pressed on in the face of even more delays. With the economy languishing for years following the stock market crash of 2008, landowners kindled hopes of making money with gas leases. In northern Pennsylvania and the Southern Tier of New York, tens of thousands of landowners began organizing into dozens of groups to lease their land. Many were organized through Denton and the Farm Bureau, and Binghamton lawyer Scott Kurkoski. Continued delays and falling natural gas prices did little to deflate expectations. A study commissioned by the Broome County government in late 2009 found full-scale Marcellus production could involve up to 4,000 wells, generate $14 billion in local spending, and support between 810 and 1,600 new jobs for a decade. At the time, there was still convincing evidence that major companies were interested in extracting gas from under Broome County. In June, 2009, a coalition headed by Dan Fitzsimmons and represented by Scott Kurkoski, announced a deal with Hess that would generate $66.5 million in lease payments and 20 percent royalties for 19,000 acres of land owned by about 700 people. The deal failed to close, however, due to differences in how the lease would be structured to control land use. Hess eventually signed a deal with residents in Northern Pennsylvania instead. After the Hess deal, political, economic, and social factors continued to erode the chances of shale gas development in New York. The anti-fracking movement would become galvanized in the summer of 2010, with the premier of Josh Fox’s movie, Gasland, on HBO. Gasland, which was screened in Binghamton and Ithaca, featured a shot of Mike Markham, a resident living near shale gas development in Weld County Colorado, lighting his tap water on fire. The movie, which also featured Norma Fiorentino’s well and other scenes from Dimock, Pennsylvania, became a rallying point for the anti-fracking movement in New York. The SGEIS was sent back to the drawing board, and when the Cuomo administration issued a revision on September 2010, it was again flooded with comments from well-organized and informed critics that led to another backlog. In years that followed, New York’s anti-fracking movement blossomed into a celebrity cause, supported by performances, rallies, appearances and speeches by Natalie Merchant, Pete Segeer, Mark Ruffalo, Bobby Kennedy Jr., Yoko Ono, Sean Lennon, Josh Fox and others. A group of professionals added credibility to star power. Sandra Steingraber, a noted author, scholar, and ecologist, became a leading figure and motivational speaker. Tony Ingraffea, an engineering professor with vast industry experience, was also a leading influence in the movement and an organizer of Physicians Scientists & Engineers for Healthy Energy. 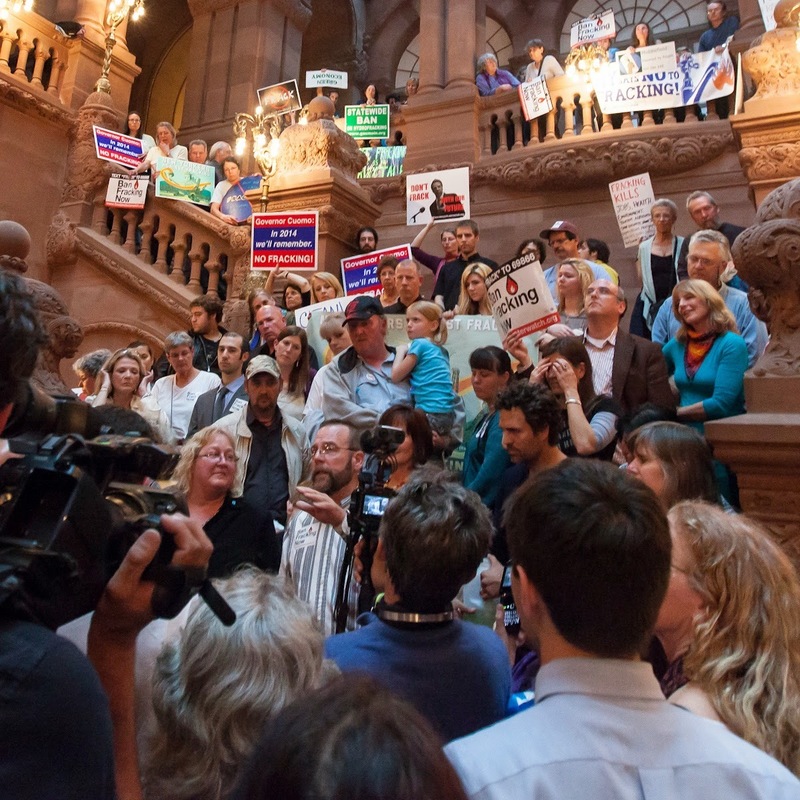 The fracking debate in New York would extend to both local and federal governments. In 2010, the federal Environmental Protection Agency was directed by Congress to use a portion of its allotted funding for a peer-reviewed study of the relationship between hydraulic fracturing and ground water. The effort -- championed by (now retired) Rep. Maurice Hinchey, at the time chair of the Appropriations Committee -- included a hearing at the Broome County Forum on September 13, 2010. That event drew about 1,500 people from throughout the region. Notably, the EPA hearing was headed by Judith Enck, who had left her job with the DEC to accept appointment as regional director of the EPA. The results of the study are yet to be released. Yet the biggest defeat for the shale gas industry in New York, prior to Wednesday’s announcement by the Cuomo administration, did not come until late May of this year. That’s when the state’s high court upheld a decision that allowed local governments to control where and if fracking occurred. The concept, know as home rule, was a result of the court’s ruling to uphold fracking bans in the towns of Dryden and Middlefield. Prior to the decision, the state controlled where gas wells went. The Court of Appeals made clear that zoning and land-use restrictions apply, and towns could not proceed without recognizing fracking as an accepted use. The decision by the Cuomo administration to ban fracking statewide Wednesday caught everybody by surprise. Hours before it was announced, I was scheduled to cover a town board meeting in Windsor, where officials intended to discuss changes to land use plans to allow fracking. Windsor was one of many towns along the Pennsylvania border going through that process – which was deemed necessary before the state could issue permits. Now, much to the dismay of people like Dan Fitzsimmons, the issue of local control is moot. Antifracking activists, who were geared up to fight a decision from the governor’s office that would permit fracking, also have to make some adjustments. Dawn Lodor, the manager at GreenStar said the store had commissioned a bus to take fractivists to a rally in Albany in January to protest fracking. They are still going, but now they plan to make it a public celebration. I have spent the last few days going over the "history" of events that led to the ban in NY. It has been a rough few days. While I am very happy for NY, I am shocked at the physical distress and emotional letdown I am feeling for PA. If I were to write this synopsis it would certainly include some heart wrenching accounts of the trials and tribulations of my neighbors and friends here in the gasfield. The icing on the cake after the NY announcement was the cake comment from our governor elect Wolf. His unfortunate "unfortunate" comment just about blew my head off of my shoulders! I would like to tell my story some day. It certainly includes visits from Tom Wilbur and so many more that came here and wanted to know what was really happening. I don't see a happy outcome for Pennsylvania. PA citizens want their cake and to eat it too. NY will have to make do with clean water, clean air and healthy produce. Sadly, we built our dream home on the wrong side of the border-just a few miles to north is a place that cares about their children. Her name is NY and I am pleased to have met so many of her people. No doubt the case studies in Pa. played major role in political calculations in NY. Norma’s well (and by extension the Dimock fight) was merely an icon of much broader series of events and influences that may have gone unnoticed in another time and place. "...the Dimock fight) was merely an icon..."
Tom, you remind me of the Tin Man in the Wizard of OZ: if you only had a heart. Sometimes, you do need to know when to see the trees of the forest, not the forest for the trees...and I'm going to stop right there. Welcome back, Tom. Here's my distillation. Someone said to O&G, *you want to do what?" O&G said, "drill the living bejesus out of New York." Others asked, "why surely this falls under federal enviro regs?" Where O&G replied "what enviro regs and don't call me Shirley." Follow our trades right now & earn up to 270% daily. DISCOVER How You WILL Master Your Habits And Reprogram YOUR Subconscious Mind To Get Any Result You Want In Your Personal Growth and Fulfillment! Come and see how THOUSAND of individuals like YOU are earning their LIVING by staying home and are living their dreams TODAY. Thanks for this information, I think it will come in handy in the future. order a paper essay.